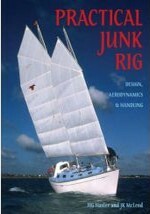 Junk Rig the ideal cruising sail. 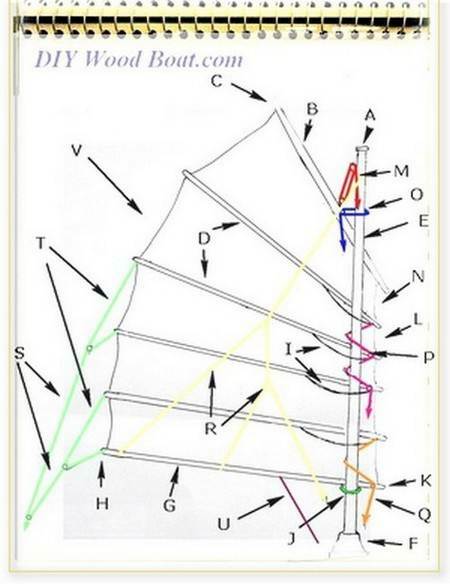 The diagram below of the Junk Rig describes the basic configuration of the western version of the Chinese sail. Over the thousands of years in which the Chinese rig has been evolving, there have been numerous variations on the theme. The simplified western version as described by ‘Blondie’ Hasler and Jock McLeod in Practical Junk Rig has become the basis for many variations fitted to all manner of pleasure craft. Apart from its sailing qualities, the junk sail, because it is so low tech lends its self admirably to home building. All the fittings on a Junk Rig mast must be either above the yard or below the boom when the sail is fully raised. These upper fittings will include the main halyard, the mast lift and the lazy jacks. To allow for the sail swinging around the mast the halyard is normally hung at an angle of between 30 and 40 from the fore and aft line. Other fitting such as navigation lights, aerials and wind instruments should be located above these. The yard is the spar or batten along the head of the sail. This batten supports the full weight of the sail when hoisted so needs to be relatively strong. When the sail is raised and trimmed this batten elevates the peak of the sail. The peak is the top aft corner of any 'square headed' sail. The battens are what give the junk rig its distinctive fan shape. Originally made from bamboo these are nowadays made from a variety of materials from wood to aluminium and more exotic modern composites. Traditionally, the battens made for a flat shaped sail however, there have been many recent refinements to make ‘bendy’ battens which give the sail a more aerodynamic shape. Junk rig masts are normally unstayed to allow for free movement of the sail around the mast. For support an unstayed mast is normally keel stepped with reinforced mast partners at deck level. Masts have been successfully made from wood, aluminium and steel as well as more expensive modern materials. A Mast Skirt or Mast Boot is fitted above the partners to any keel stepped mast to prevent water getting below. The boom is the lowest batten on a junk sail. Unlike other fore and aft sail rigs, the junk rig boom is only partially responsible for controlling the angle sail and the forces are not as great so, it does not need to be as strong. The clew is the lowest corner of a sail at the aft end of the boom where the sheet is connected. It could be argued that a junk sail has several clews, one on each batten that has a sheet span attached. The batten parrels are short lengths of line or strap which help to hold the sail close to the mast. They also determine how the batten will align, fore and aft, when it is lowered. They need to be long enough to allow the sail to be trimmed fore and aft and allow the sail to be easily raised and lowered. The mast lift supports the front end of the sail bundle close to the mast when the sail is lowered. This line runs from the mast head outside the sail and is looped around the mast below the boom. The tack is the forward lower corner of any fore cornered sail. The luff is the leading edge or front part of any fore and aft sail. The main halyard is used to raise the junk sail up the mast. As the junk rig tends to be rather heavy the halyard is often rove in a multi-part purchase. It is usually attached forward of the middle of the yard and runs through the block at the mast head then down to the base of the mast and back to the cockpit. The throat on a junk rig is the part of the luff of the sail just below the yard. The function of this parrel is to control the fore and aft position of the yard. It also helps to control the lateral position of the higher battens. This parrel controls the middle battens. As well as controlling the fore and aft position it also exerts a downward pull on the forward end of the battens. This parrel controls the position of the boom and also acts as a tack line holding the tack of the junk sail down. The lazy jacks serve to tame the junk sail during reefing and dropping, holding the spars and sailcloth as they drop between the lines. It also acts a topping lift preventing the aft end of the sail dropping as it is lowered or reefed. These control the angle of the sail depending on the wind direction. On the junk rig one sheet will control several battens via the sheet spans. These lines connect groups of battens a sheet. Traditionally, the sheet would be connected to the sheet span via a ‘euphroe’. A euphroe is a wooden block with holes through it. The friction on a line running through the holes allowed for the adjusting of the tension on the sheet spans. It is quite common on western rigs to simply use double blocks. This tack line is really a boom vang, whose purpose is to hold the boom down. The leach of any fore and aft sail is the trailing edge of the sail. 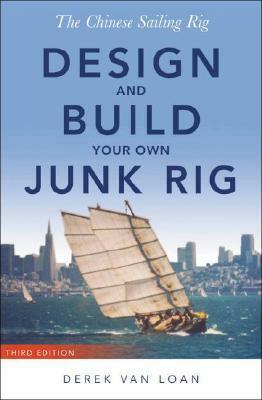 The junk rig is becoming increasingly popular among western pleasure boaters because of its ease of use. It is also becoming popular in many different guises, as home builders modify and improve on the basic principles to suit their own craft. The low tec nature of the rig makes it ideal for experimentation, even using low cost poly tarp to make the sail panels. There are numerous examples of boating folk using variations on the theme on canoes, day boats, cruisers and even super yachts. However, there are some constructional considerations to be taken into account before you decide to convert a boat to Junk Rig. Further information on Junk Rig at The JRA and The junkrig forum.